The Toyota Prius is a car that paved the way for hybrid technology and sparked a motoring revolution! The Japanese manufacturer has carried this technology revolution across a significant proportion of their Toyota Models. Earlier this year the original hybrid reached its 20th anniversary, with the 4th generation model being the lucky car to mark this special birthday. The Prius is the eco-enthusiasts’ champion car! When the part petrol and electric powered hatchback drifted silently onto the scene, it was praised by eco enthusiasts and A-listers everywhere as it gives consumers a way of cutting back their carbon footprint. Today, there are now a large number of competing hybrids and all-electric vehicles on the market, but that hasn't stopped the Prius - it’s still the world’s best-selling non-fossil fuel car with Toyota having sold over 3.6 million of them. It’s always been a big hit in the US and Japan, but Toyota are wanting to push the 4th generation car and spread the eco-love throughout the rest of the planet, with Europe being the next big focus. Since it’s emerged from its teenage years, the 2016 Prius has been revamped to make it appeal more of a family audience. It now contains an array of first-class safety features, modern tech additions and provides all round comfort for everyone inside. Because of these extra additions, this has meant the famous Prius no longer needs to just rely on the eco-friendly novelty factor to be a contender in its class. Something that also works in Toyota’s favour is the fact you never have to plug it in which gives it the upper hand against other plug in vehicles. The battery pack is cleverly charged by the petrol engine and harvests energy produced from braking. The car is powered continuously by the 71 bhp electric motor and is the only form of propulsion at lower speeds. This means that when on the move the Prius is virtually silent, so you can expect a quiet relaxing journeys with the family. In fact it's so silent, the only clue that's given when the car is ready to move is the dashboard lighting up! The new battery pack has the ability to recharge 28% faster than its predecessor the 3rd generation Prius and there are 4 driving options available; Eco, Normal, Sport and Power so you can pick the best suited driving mode to match your type of driving. In the new 2016 model, Toyota have repositioned the nickel-metal hydride battery pack which has moved further under the rear seats and as a result, has freed up 10% extra boot space taking the capacity up to 502 litres. This is plenty of room for weekly shopping and your family’s luggage. Driving is made a breezy and effortless so you can relax when behind the wheel. With Stop/Start button technology and an automatic gear shifter that’s quick and easy to use you can focus more attention on the road. This is made easy with the low waistline and extra wide windscreen which gives great all-round driving visibility with few blind spots to worry about. Access everything you need on the centrally mounted screen and dials on the dashboard, the positioning of these make everything an easy reach especially the navigation and stereo controls which are manageable through the touchscreen. Awarded with 5 stars by Euro NCAP for safety, you can drive safe in this model with your family thanks to a range of safety features. 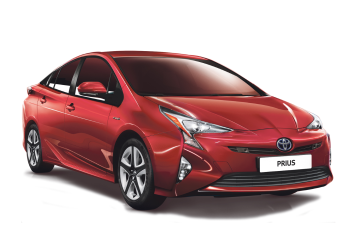 As standard the new Prius comes with Toyota’s Safety Sense’ package which includes, Autonomous Emergency Braking, High Beam Assist and Traffic Sign Recognition. You're spoilt for choice with 4 grades to choose from starting with Active then moving up to business Edition, Business Edition Plus and the highest spec Excel trim. ● Touch 2 infotainment system. ● Blind spot monitoring system. So how has the 2016 Toyota Prius evolved into its latest almighty form? It has definitely grown up and evolved into a more mainstream sensible family car.